File Name: Mark Habershaw of Smithfield, Rhode Island. Notes: Smithfield is in the central part of the state, just north of North Providence. Notes: DiC's Sub-Zero wore the 1990 outfit, with a grey knit cap beneath his hood. He was mild-mannered, in contrast to his filecard description. Accessories: dark grey M60 machine gun with handle on top and bipod with long legs and tiny clip to attach to machine gun (new), small white mortar tube with sight and circular mortar base (new), four dark grey mortar shells with fins on back (new), dark grey pair of elliptical snowshoes, slightly pointed in back (new), large white survival backpack with tabs for accessories (new), gold ammo belt with no tabs or slots (new). SUB-ZERO was an instructor at the Army Northern Warfare Training Center in Fort Greeley, Alaska and a consultant to the Cold Regions Test Center at the same facility. He beat all records for cold weather endurance solely on MEANNESS! Before he was tapped for G.I. 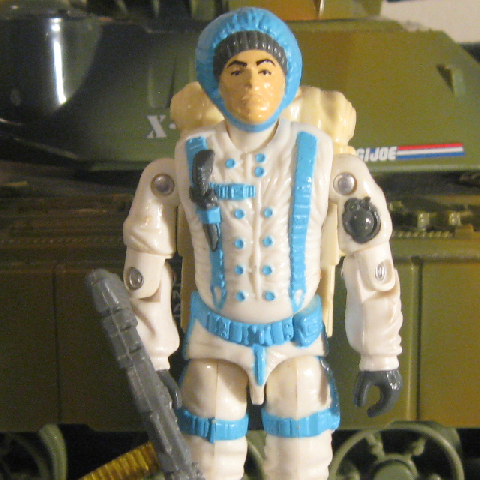 Joe, Sub-Zero used his "deep-freeze" combat tactics in Europe's Operation Chill so that the troops would be well prepared if any winter confrontation should erupt. "All the other G.I. Joe Arctic specialists like the cold. Not Sub-Zero! He hates it to the MAX! It drives him so far up the wall that it brings out a special kind of meanness unheard of in the western world. We're talking MAXIMUM MEANNESS! So why does he keep volunteering for cold weather assignments? Because he enjoys being MEAN!" Toy Notes: Featured in 1990's first new figures commercial. Item #6565. The prototype shown in the 1990 insert catalog has its upper arms on opposite sides. 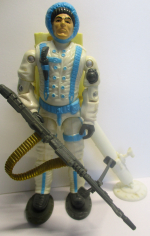 Toy Notes: Exclusive to the mail offer Terrifying Lasers of Destruction, along with Stalker, Dee-Jay, and Snow Serpent.